Christina succeeded her father Gustav II Adolph (The protestant military leader of Sweden during the Thirty Years War who died at the Battle of Lützen) to the throne at the age of five, and began ruling in 1644 when she came of age. She was raised in every respect to become a queen: she was as much fluent in 12 languages as competent in fighting skills and had a keen sense for art. Having experienced the horrors of war through secret visit to the battlefield, Christina found it was necessary to end the war. At the age of 18, she extorted the immediate conclusion of the Thirty Years War from the State Council. The Peace of Westphalia in 1648 was, according to Henry Kissinger, not only the basis of the division of the new Europe but also of the peace treaties, for centuries. The young Swedish queen then inspired Sweden and the completely devastated Europe to a new awakening in architecture, art, culture, science and philosophy. She founded universities such as the Uppsala University, financed hundreds of theatrical and operatic performances, sponsored artists and musicians; formed her Court of Learning where she had specialists in all branches of knowledge and many influential men of the time such as René Descartes. 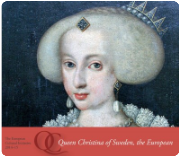 Christina abdicated throne in 1654 at Uppsala and officially converted to Catholicism in Innsbruck (previously in Brussels unofficially) in the same year. Following her settling in Rome in 1655, Christina became one of the most distinguished cultural patrons of the period: she employed the Who-is-who of Baroque music such as Scarlatti, Stradella, Pasquini and Corelli, opened the first public opera house in Rome (Teatro Tor di Nona) and founded an academy (Arcadian Academy). Christina died in 1689 in Rome; she is one of the two women buried at St. Peter's Basilica in Rome. The Austria Baroque Academy represents Austria in this European cultural initiative with a particular accent on the previously forgotten, neglected and ousted women composers of the 16. and 17. centuries: “Female Composers” places a special emphasis on a European promoter of art and music and, whether courtesans, virtuosos or nuns, brings women out of the archives of the music history. Special programmes have been developed; ensembles have been brought to Europe. Concerts and seminars have been held in Kirchstetten, ORF-Radiokulturhaus Vienna, at the master classes in Gmunden, during the Salzkammergut Festwochen in Altmünster, in Innsbruck, as well as in Warsaw, Schwetzingen, Bergerac, Stockholm and Bodrum.